Date/Time - 17 Feb (Friday), 7.30 p.m. – 9 p.m. The public space is now increasingly shared with people who resonate with kindness but who may be agnostics and atheists. Come for this lecture by Dr William about how Christians can start, show and share kindness with a conviction that we are driven by our faith in an ethical monotheism, as well as how to bear effective witness to the God who is kind and who has shown His kindness in and through the Gospel. Organised by ETHOS Institute™ for Public Christianity. Register at ethosinstitute.sg/kindness. Free admission, but a love offering will be collected. 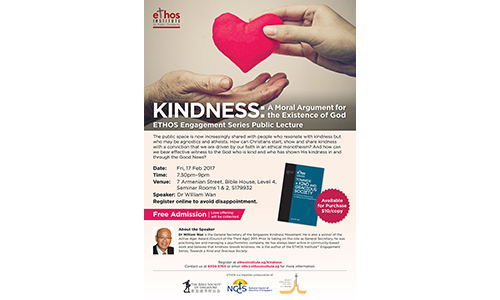 For more info, email info@ethosinstitute.sg or call 6304-3765.